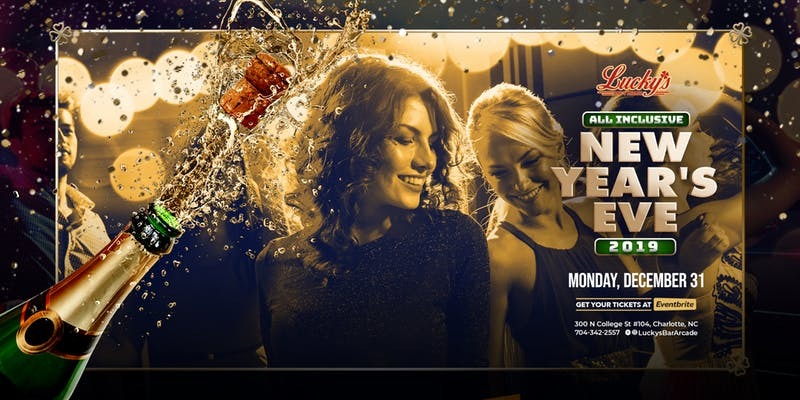 Come ring in the 2019 New Year at Lucky’s! Celebrate New Year’s Eve with close friends, exciting music and your ALL-INCLUSIVE DRINK TICKET. That’s right, this New Year’s is ALL INCLUSIVE (tokens not all inclusive). The DJ will be playing your favorite songs all night. Champagne toast at midnight and party favors included! General	Admission- All	Inclusive - Beer, Wine and Liquor. Red Bull and shots are NOT included. Doors open at 9:00pm. All sales are	Final, No Refunds!